Please note that the CASE dues of $60.00 are already calculated for you in the SAM dues totaling $200.00. Annual membership dues in CEC include $24.00 for a subscription to Exceptional Children and $36.00 for TEACHING Exceptional Children. Annual membership dues in CCBD Division include $8.00 for subscription to Behavioral Disorders, annual membership dues in DDD Division include $8.00 for subscription to Education and Training in Development Disabilities. This information is given in order to meet postal regulations. Please do not use as a basis for payment. 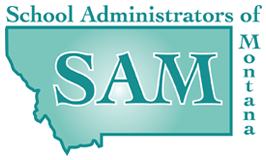 The School Administrators of Montana (SAM) office processes the CEC Dues with divisions that you have chosen individually as well as the Montana Council of Administrators of Special Education (MCASE). Dues should be sent directly to SAM not to CEC. Contributions or gifts to SAM are not deductible as charitable contributions for federal income tax purposes. However, dues payments may be deductible by members as an ordinary and necessary business expense.